Does that sound too good to be true? How can you score First Class Honors with Distinction in only 6 weeks of study? An even bigger challenge? Doing that on the Advanced Rudiments Theory exam! 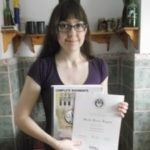 How can you do the Complete Rudiments Music Theory Workbook in 6 weeks and write the Advanced Rudiments Exam and receive First Class Honors with Distinction? Sacha Perry-Fagant did just that, using the Complete Rudiments Workbook. What's the Complete Rudiments Workbook and how can it help you get First Class Honors with Distinction? The Ultimate Music Theory Complete Rudiments Workbook is a unique workbook that progresses through all Basic, Intermediate and Advanced Rudiments concepts quickly and thoroughly in ONE 256 page workbook. The Complete Music Theory Workbook prepares students for successful completion of their Advanced Rudiments Theory Examination. 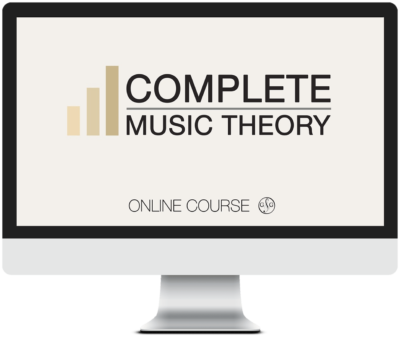 The Complete Theory Workbook is designed for the older music student, the Intermediate or Advanced Theory student, and the student who is preparing to take an entrance exam into a College or University Music Program. Sacha Perry-Fagat, a Voice Student who received First Class Honors with Distinction on the Royal Conservatory of Music Advanced Rudiments Theory Examination, writes: "I am glad I used this book. The material was easy to follow and I was able to absorb it quickly." Her Teacher (and mother) Anita Perry writes: “Sacha is 18 and completed her grade 7 voice exam with 1st class honors. She was recently awarded a scholarship for the highest mark in grade 7 from our South Okanagan Branch of the B.C. Registered Music Teachers Association. Sacha is currently studying Sciences at McGill University in Montreal and while I was "officially" her theory teacher, she pretty much taught herself using your Complete Rudiments Workbook with Answer Key. Every once in a while, she'd come to me and ask a specific question like "Does it make a difference whether the note name is capitalized or not when indicating chords?" and then she'd go off and do some more exercises. My daughter, Sacha Perry-Fagant, used the Complete Rudiments Workbook. It took her about 6 weeks of study in the summer. She received her Advanced Rudiments Certificate which states her RCM examination mark as First Class Honors with Distinction. 1. Download the Ultimate Music Theory Free Complete Rudiments Lesson Plans. Complete each exercise on each page. Use the Answer Book to check your work. 2. Dedicate a specific time for study each day. Focused study time and goal setting is the greatest motivation for achievement. Attitude - YES I can do it! 3. Do all the practice exams in the Ultimate Music Theory Advanced Rudiments Exam Series Set #1 and Set #2. Use the Answer Books to check your work. Effective teaching strategies and cutting-edge learning materials will make your life a whole lot easier! Learn Faster - Retain knowledge and implement what you have learned. Save time - Creative Done-For-You Lesson Plans that will save you hours of prep time. Accurate Marking - Answer Books for fast and easy marking - more free time. Exam Success - Achieve First Class Honors with Distinction using the Ultimate Music Theory Exam Series! P.S. Rather than being overwhelmed, why not learn how the Ultimate Music Theory Complete Rudiments System can work for you. It's easy! Join the conversation. Have you ever received First Class Honors with Distinction in 6 weeks? Share your story below.